What kind of world have we created? Increasing numbers of us live in fear of losing our homes and jobs, many forced to rely on the charity of food banks to feed ourselves and our children. Many of us live on the streets in utter destitution, often with mental health problems, and no-one seems to care. Many more of us live in poor countries where for want of clean water and basic sanitation we must watch helplessly as our children and infants die in their millions every year. At the other end of the scale some of us have wealth that can’t be consumed in a thousand lifetimes. Then there are the environmental dangers that we all face – scarcity of fresh water; widespread pollution of the air, sea and rivers; deforestation; loss of biodiversity; and above all climate change – and our governments, severely handicapped by those of us with vested interests, unable to take the decisive action that is necessary to combat them. Why is it that the world’s abundant wealth is spread so lavishly for the very few and so thinly for the very many? Why is it that we understand so well the dire consequences awaiting us from environmental catastrophe yet seem unable to do more than a fraction of what is required? This book presents the results of an exploration into these concerns by someone who feels deeply disturbed by them; who feels that people in great numbers are being squeezed beyond breaking point; who feels that we are racing headlong towards a cliff edge with people who claim to be in control but whose hands are tied. The exploration bore fruit. 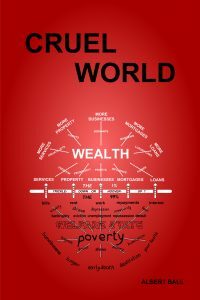 It revealed that the major systems that underpin the modern world maintain themselves by widespread exploitation of the disadvantaged, made possible by equally widespread ignorance of how it happens. It doesn’t have to be that way. We can turn a world on a collision course with nature into a world sustainable for the very long term. We can turn a cruel world into a kind world, but to do so requires a broad public understanding of what is really going on. The purpose of this book is to help provide that understanding. Albert Ball is a retired electrical engineer who began his career in 1964 after being accepted by British Railways for an engineering sandwich course, spending alternate six monthly periods training in industry and studying at university. After qualifying he worked for the railway in Derby for six years, mainly on control systems for electric traction supplies on new and existing electrified lines. In 1975 he attained professional status as a Chartered Engineer, becoming a full member of the then Institution of Electrical Engineers, now the Institution of Engineering and Technology. Also in 1975 he joined the UKAEA near Warrington, specialising in nuclear reactor control and safety systems. In 1989 he joined the Nuclear Installations Inspectorate, a division of the Health and Safety Executive in Bootle, as a Principal Nuclear Inspector, specialising in the safety assessment of control, instrumentation and protection systems for power reactors and nuclear chemical plants. He retired in 2012 at the age of 65, since then largely spending his time reading widely on economic matters and in writing this book. His very minor claim to fame came from his fascination with computer programming, beginning in 1982 when he bought one of Clive Sinclair's Spectrum computers. He enjoyed some early success in writing Spectrum computer games, the most popular being Jumping Jack, published by Imagine Software in 1983, for which at only ten years old his son Stuart prepared all the graphics; followed by Rapscallion, published by Bug-Byte Software in 1984. He is married, has three sons and one grandson, and lives in Southport, Merseyside, UK.